When designers start to question what words such as ‘good’ and ‘bad’ and ‘soul’ really mean, they can’t avoid ethics. And that’s no bad thing. The current interest in ethics and its relationship to design seems a jolly ‘good’ thing to me – indicative of increased scrutiny of what designers offer and what they leave behind. But this is a convoluted and protean business and is not to be confused with the notion of ‘selling designer souls’. This rather comical phrase is sometimes misunderstood as shorthand for ethical awareness, but it focuses the debate on the individual designer soul – ethics is a bit bigger than that. Twenty years ago, having just left art college, I naively set myself a rather grandiose problem to solve: to make the world a better place through design. With an almost missionary zeal I set about ‘doing’ in a way that I thought was obviously ‘good’. To begin with it seemed fairly simple to me – it’s OK to work for nice people (generally on the left, obviously) and not to work for those nasty business people on the right – and so on. Then the Wall fell, the left became the right(ish) and what had seemed like simple demarcations became a bit of a blur. I was confused and unhappy. This was no ‘bad’ thing. In common with many designers I had been preoccupied with organising – tidying up the world in the hope of finding some order amid the chaos. I had wanted some ‘goodness’ rules to follow but I’d not spent enough time considering what ‘being good’ in graphic design terms really means. So, in writing and researching the book Good I started to unpack the phrase and found it encompasses many things – most are related to ethics. Within philosophy, ethics is the branch of knowledge concerned with moral principles. This is not primarily in order to develop strategies by which to judge one another. It is about the pursuit of truth – questioning whether there is such a thing as the property of ‘goodness’ and testing the resultant ideas against various models. I wanted to do some of the same within design. I started by talking to the philosopher A. C. Grayling and then Richard Holloway (retired Bishop of Edinburgh and now chair of the Scottish Arts Council), Delyth Morgan (a British Labour peer who used to work in communications) and Jacqueline Roach (a barrister who used to work in voluntary sector press and publicity). In these conversations some themes recurred which I went on to explore in essay form and in conversation with design practitioners. Some of the persistent issues are listed here. When ‘ethics’ and ‘graphic design’ are put in the same sentence, two subjects inevitably come to mind. One is that of production methods – recycled paper and so on. The other is the client. ‘The client’ is shorthand for ‘the client’s message’. The job of graphic design is generally to persuade – so do we have a responsibility to be mindful of what we are persuading people to do or does this role as censor sit uncomfortably alongside tolerance and openmindedness? The free market has delivered enormous choice, but design plays a part in encouraging insatiable desire – with the resultant discontent and environmental consequences. Capitalism thrives by encouraging entrepreneurialism – which is perfect for many designers – but design is a competitive business that requires enormous self-belief and self-determination, and therefore engenders insecurity and envy in its practitioners. Does being successful within this framework necessitate bad behaviour? Should we be more critical of what we consider to be design achievement? For many designers the property of goodness lies primarily in aesthetics. When a piece of work is deemed ‘good’, really what we mean is either that it is to our taste or that we think it has merit for expressing the zeitgeist or being ground-breaking in some way. However, if we consider aesthetics more deeply, it relates directly to ‘goodness’ in an ethical sense. Is our work good if it engenders happiness, for example – if it adds to someone’s quality of life by making the world a more delightful or pleasurable place? This argument runs contrary to the belief that ethical work is necessarily less visually engaging, the result of a misconception that design is a luxury add-on associated primarily with wealth. Perhaps this belies the notion that being an ethical designer requires a self-sacrificial subjugation of artistic drive, with a resulting dissatisfaction and unhappiness? We don’t need to have experienced something to imagine what we would feel if we were in a similar situation to someone else. Almost all world religions and secular belief systems agree on one principle: the ‘golden rule’, or ethic of reciprocity, that says: ‘treat others as you would wish to be treated’. What this prescribes is consistency between our desires for ourselves and for others. Applying this rule within design might mean we are more polite, take plagiarism more seriously, argue for environmentally friendly print techniques or advocate inclusive design. But this is not as simple as it seems. Take the last example: most designers fear that in order to achieve access for all they will have to adhere to creatively restrictive guidelines. So accessible design could result in exclusion of a different kind – aesthetic refinement. Could it be argued then that goodness does not lie in the design outcome alone but that the intention of the designer has some bearing as well? Our ethos is expressed both professionally and personally but consistency between the two is sometimes hard. In accepting a commission we agree to do a job to the best of our abilities, on time and within budget. In exchange, we have the right to be paid as agreed and not to be hindered in our job. How then do we justify marking up print and not telling the client, or saying yes to a deadline we know to be unachievable – lying in other words? Easy – because clients think nothing of pulling a job at the last minute, are always late themselves and, despite the fundamentally neutral nature of the exchange of money for services, abuse financial power all the time. Is the problem that the market decides all? Free pitching, for example, is unethical, in that clients are being given unprotected design ideas for free, but while ours is a buyer’s market it will continue. The market will not determine best practice, so would some kind of otherwise determined code perhaps be useful? Having embarked on this investigation I find that a consensus is emerging. Grayling argues that ‘A code that says “thou shalt” and “thou shalt not” is inflexible and fits awkwardly with real life, which is complex and protean. Therefore to devise an ethical code for designers, one would do better to say: here are examples of what a responsible and well intentioned designer might be like; go and do likewise’. Implicit in this is a belief that goes far beyond the immediate realms of design: that it is possible to change many things for the better. The value of considering ethics in any activity lies partly in being forced to question the fundamental nature of things. For designers, the eye may be the window of the soul – but one that is looking out rather than in. 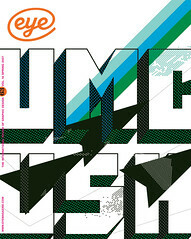 See also Lucienne’s talk for Eye Forum no. 1, ‘Burning Issues’, held at the RSA, London, 23 Sept 2006 and published in eyemagazine.com. Quotations below adapted from Good: An Introduction to Ethics in Graphic Design. (AVA Publishing, 2006) by Lucienne Roberts. See also Lucienne Roberts’s talk ‘Being good’ which was given at Eye Forum no. 1, ‘Burning Issues’, that took place at the RSA in London, 23 November 2006.